Black Mask Studios has brought the world some amazing books: We Can Never Go Home and Space Riders to name only a few. With The Dregs, we get a book that shocks, awes, and opens our eyes to a different kind of world, and a different kind of hero. Something is foul in the downtrodden part of Vancouver. A string of homeless people have come up missing, and the first few pages graphically show us where they are ending up: on the plates of a high end restaurant. One of those missing is Manny, a resident of The Dregs, the alley dwelling of those down on their luck. Manny’s friend Arnold decides to strike out on his own to see what happened to his friend, which isn’t an easy journey as Arnold himself is strung out on the drug Listo, but that doesn’t stop him from storming in to meetings and demanding answers and following the clues he has through the streets. From writers Lonnie Nadler and Zac Thompson and artist Eric Zawadzki, we get a very graphic look at the seedy underbelly of this world. Arnold is not your typical “hero”, but this isn’t your typical story. Arnold takes the role of a makeshift detective, doing what he can to find out what happened to his friend. It’s an ugly world, but illustrated beautifully by Zawadzki. The book is stark and shocking, and hooks the reader at that last page, leaving me wanting more. The Dregs is a fresh new story, different from what’s on the shelf today. Black Mask is known for their imaginative books that push the envelope. 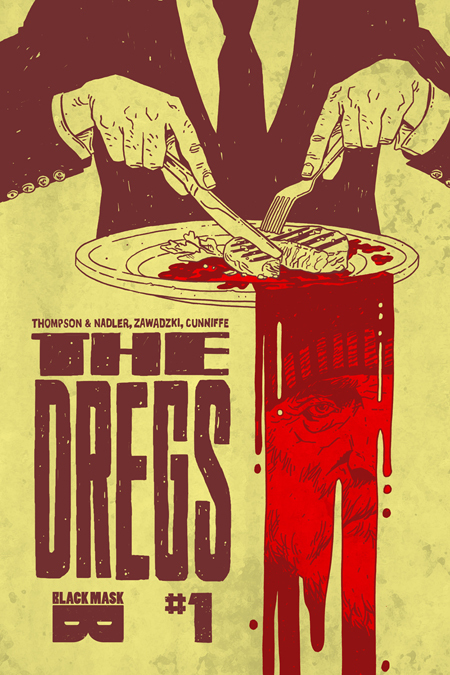 The Dregs definitely pushes the blood soaked envelope in this mature readers book. If you are looking for a book outside of the super hero norm, then The Dregs doesn’t get much better. Rating: 9.5 out of 10. 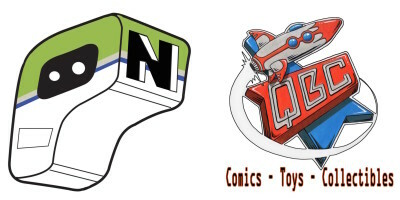 This comic book review was created in conjunction with QBC Toys and More, a local comic book and collectible shop located in Victorville, CA. Featuring new comic books every week, collectibles, action figures, original artwork, and more, QBC has something for the pop culture lover in us all. You can find them on Facebook at https://www.facebook.com/QBCToysandMore/.